Bremen, March 12, 2019 – Univention has launched the latest release of Univention Corporate Server (UCS). The enhancements of version 4.4 focus on a number of new features, higher security and more comfort. With the application “Admin Diary”, UCS now supports administrators in making administrative activities traceable. For more security, password policies can be defined more strictly and flexibly with the new version. UCS 4.4 has also added support for trusts, which enables the integration of services operated in Microsoft domains. Users can now enjoy an enhanced Self Service that eliminates the need for numerous admin requests. At the same time as UCS, Univention is releasing an updated version of UCS@school specifically for schools and school authorities, making it much easier to connect to external services. Univention invites users, IT experts and technology manufacturers to the 11th Univention Summit in Bremen. Under the motto “Use your Identities”, more than 350 guests will come together on 31 January and 1 February 2019 to converse on the secure use of digital identities and the associated data as well as on the digitisation of education. In addition, numerous IT managers from companies and the education sector will speak about the successful use of open source software in their respective organisations. Bremen, August 15, 2018 – Univention, a specialist in IT infrastructure and identity management, offers software manufacturers an attractive distribution channel: They can sell their solutions directly online via the Univention App Center. IT service providers and system houses are now able to combine tailor-made solutions from a broad portfolio of business applications to their customers. The Univention App Center is a central component of the ID management solution Univention Corporate Server (UCS) and makes the installation of cloud and enterprise applications almost as easy as the installation of smartphone apps. The advantage for everyone involved: In addition to providing the software, Univention also handles the entire billing management. 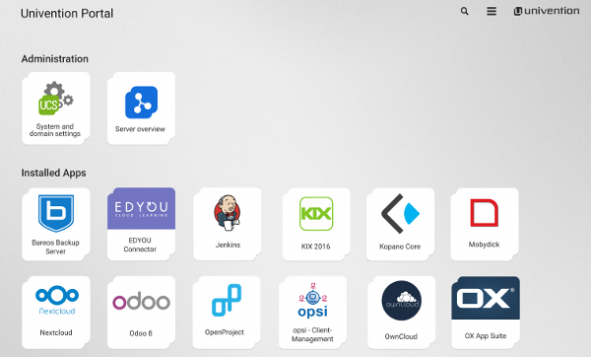 The App Center already offers ownCloud, Nextcloud, Bareos, Collabora, Kopano, KIX, OpenProject and other solutions. Bremen, April 26, 2018 – Today, Univention releases the Domain Join Assistant for Univention Corporate Server (UCS). This new tool allows administrators to integrate Ubuntu machines into a UCS domain without any additional manual configuration. All users can directly log in to an Ubuntu desktop using their usual domain accounts. With this automation, Univention significantly helps administrators to manage Ubuntu clients on the network. Thanks to a Kerberos SAML integration, organizations who are already using the recently released UCS 4.3 can now also offer their users single sign-on for the Ubuntu clients. The new Domain Join Assistant will replace the previous Univention Corporate Client (UCC). However, Univention customers with a maintenance contract will receive updates for UCC until April 30, 2021. Bremen, March 14, 2018 – Univention is proud to present the latest Univention Corporate Server (UCS) release. Version 4.3 of the established Open Source software now allows administrators to customize the portal pages which can be set up in UCS to suit the specific requirements of their organization very simply via the drag and drop feature. In addition, they are also able to make the more than 90 enterprise applications in UCS’ integrated App Center available to users. The users access these applications via the portal pages and, insofar as the respective application permits, only need to log in once thanks to the single sign-on mechanism. Univention has also considerably improved the data import performance. In this way, UCS 4.3 allows smaller companies to administrate heterogeneous IT environments with ease and fulfills the requirements of larger organizations with tens of thousands of users at the same time. Bremen, October 26, 2017 – Univention, a specialist in IT and identity management, is now offering its customers yet another option for the central administration of Apple devices. With ZuluDesk, developed by ZuluDesk BV, the Dutch developer of software solutions for use in education, education facilities can now use the user accounts created for teachers and pupils in Univention’s UCS@school solution in ZuluDesk with the greatest of ease – plus, it also allows centralized administration of iPhones, iPads, and MacBooks. Hanover, March 21, 2017 – Univention is presenting the brand-new edition of Univention Corporate Server (UCS) right in time for the CeBIT 2017. With version 4.2 of the established open source software, mixed IT infrastructures can be managed via a single web interface and more than 80 other enterprise applications can be deployed. The highlight of the release is the new, freely configurable online portal, which can be flexibly adapted to the needs of organizations and individual users. A lot has also happened under the hood: With UCS 4.2 the distribution base of UCS has been updated to Debian 8 (Jessie) and a large part of the Debian packages has been made available natively. Important security and product updates can be deployed faster than ever before. UCS 4.2 will be released in early April 2017 and will be shown for the first time a live demonstration at the CeBIT in Hall 3, booth D36-620. About 300 participants met last week at the Univention Summit in Bremen. A central theme of the event was the importance of open systems for companies, schools, society and Germany as a business place. In the lecture and workshop program and the accompanying exhibition, software and hardware solutions as well as various aspects concerning the possibilities of open source were presented. Univention provided information about Univention Corporate Server (UCS), UCS@school and the business models of the Univention App Center. 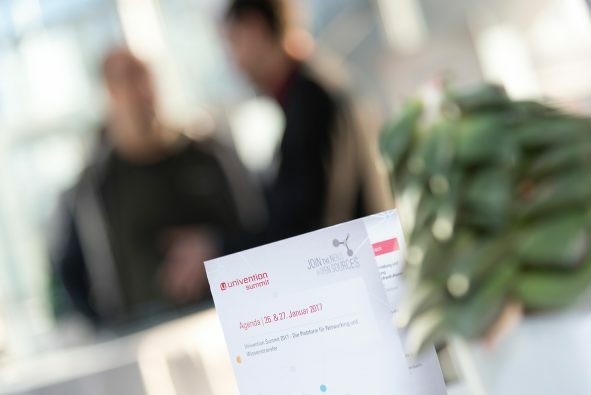 After the panel discussion with representatives of Lufthansa Systems, DB Systel and Univention, the best Bachelor and Master theses submitted to the Univention Graduate Prize were awarded. Univention, a developer of Open Source solutions for the operation and management of enterprise software, has now launched a Univention App Center Provider Portal. The online tool makes it simpler and easier for software providers to integrate their solutions in the Univention App Center more quickly and largely independently. All the necessary software packages and information can be independently administrated, expanded, and updated. Additionally, extensive testing possibilities and automation mechanisms render maintenance even simpler. Univention GmbH, a provider of open source products for the cost-efficient operation and administration of IT-infrastructure, released a new update for Univention Corporate Client (UCC), its desktop solution for the operation and administration of PCs, notebooks and thin clients. With the upgrade from version 2.1 to version 3.0 the basis switched from Kubuntu to Ubuntu 16.04 Long Term Support (LTS) providing customers with a longer support term. New features for more convenience in the administration of devices and policies were also added. Additionally, the developer decided to provide the UCC desktop image from now on as a 64 bit version only.